"Butterflies on Purple Personal Checks" product is already in your cart. The Butterflies on Purple Personal Checks Series will Immerse you in the beautiful shades of purple colors. Feel the flutter of the butterfly wings touching you with a heart-warming energy. Make bank check writing fun again with your new colorful and attractive checks. 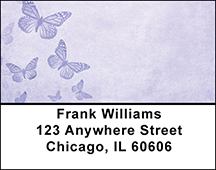 Complete your new check order with matching Butterflies on Purple address labels and a coordinating checkbook cover. Order Now! Don't forget to sign up for our VIP program for even more savings on future orders.